A newborn baby supplies checklist contains all of the essentials that you'll need for baby's arrival. Since family members and friends may help you stock your baby's nursery, it is useful to have a baby item checklist handy so you can see at a glance what purchases you still need to make. Standard checklists will include baby necessities, such as diapers, bottles, wipes, etc. Click the image to download a printable checklist based on the items detailed below. Check out some helpful tips for downloading the checklist. Feel free to print this list out, and place it on your fridge or any other conspicuous place. Make a copy to keep in your purse, and update it regularly, marking off items that you purchase yourself or receive from others. Revise it as needed. Disposable diapers - For now, newborn sizes will be best. You'll have plenty of time to buy larger sizes later. Cloth diapers - Even if you don't plan on using them, they are great to use as burp rags, etc. If you do plan on using them, you'll need two or three dozen, and you'll want the following supplies: diaper pail, waterproof diaper covers, and diaper pins or Velcro. Pacifiers - Purchase two or three different kinds. You'll baby will let you know what kind he prefers. Bulb syringe - For suctioning out stuffy noses. Alcohol - Used to clean around the umbilical cord. Ask your pediatrician what he or she recommends, however. Vaseline - Used on a little boy's circumcision to help provide a barrier against moisture. Don't get carried away purchasing those adorable, dressy outfits. Purchase the essentials in multiple amounts, then buy a few special outfits. 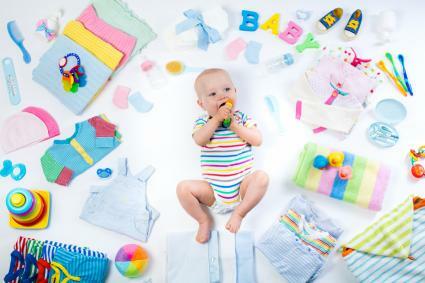 Your baby will soon outgrow the newborn sizes, and you'll quickly need to buy larger items. Some parents skip newborn sizes altogether and go straight to purchasing 3 to 6 month sizes. Onesies - Six to eight will get you started. Buy long and/or short-sleeved onesies depending upon the climate and the season. Gowns - Six to eight gowns, and look for elastic hems. Sleepers - Six to eight terry cloth sleepers will work for almost any season. Socks - Six to eight pairs should do it. Bibs -Purchase four to six of these. Sweater/jacket/coat - Depending upon the weather, you may only need one or two. Outfits-Just a few should do. These may vary depending upon whether your baby is formula-fed or breastfed. They may not be strictly necessary, but the following supplies and products are very useful for new parents. Obviously, this list could go on and on, depending upon how specific you need to make it and what your preferences are. This list is a great starting point that you can use to begin, then customize the document to meet your specific needs. To determine what else you might need, browse through a local baby store or the baby section of a large department store like Target and check out the latest baby items. You may be surprised at some of the items you didn't know existed but that could make your life easier as a new parent! Many of these stores have computer registries that you can access in the store, or you can go to the store's site online and generate your very own customized wish list that can also serve as a checklist. Not only will this help friends and relatives as they search for gifts for you and your newborn, but it will also let you narrow down the must-haves on your list as you prepare for the arrival of your infant.